A classic Mexican dish, these Shrimp Fajitas are delicious, easy to make and ideal for any meal. 1. Mix the shrimps, red chilli powder and salsa in a bowl. 3. Heat 3/4 tblsp of oil n a pan over medium flame. 4. Saute the onions and capsicum for 2 to 3 minutes. 6. Add the remaining oil to the pan. 7. Add the shrimps and cook for 2 minutes or until opaque in the center. 9. Add the onions and capsicum to the pan. 11. Sprinkle some salt and cook for a minute. 12. Warm the tortillas and place them on a flat surface. 13. Divide the shrimp mixture among the 4 tortillas. 14. Add guacamole, cabbage and sprinkle some coriander leaves. 15. Serve with lime wedges. 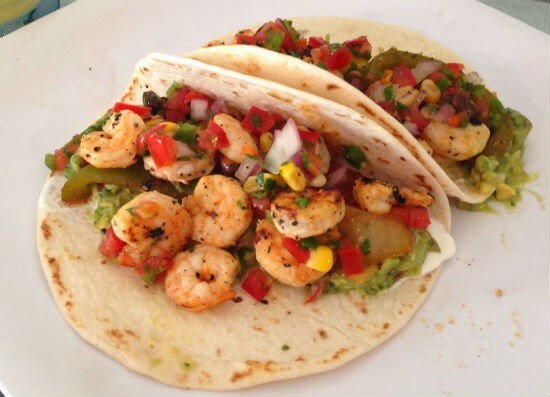 Feel free to comment or share your thoughts on this Shrimp Fajitas Recipe from Awesome Cuisine.